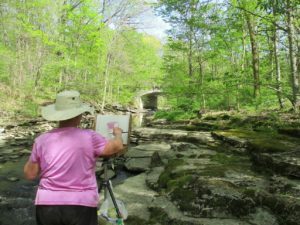 Gallery on the Square, a retail art gallery in Danville, IN, is hosting a plein air event titled, Artists Paint the Town, on Saturday, August 25, 2018, from 8:00 a.m. until 4:00 p.m., followed by a cash-awards presentation at 7:00 p.m.
What is “plein air”? Plein air is a French term that translates to “in the open air” and is the act of painting outdoors. It has been practiced for centuries, but it was the French impressionists, such as Claude Monet, Vincent van Gogh, Edgar Degas and Pierre-Auguste Renoir, who established plein air as a universal art movement. 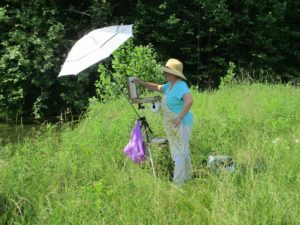 Is Artists Paint the Town just for experienced plein air artists? Absolutely not! It is open to anyone who wants to paint outside. Registered painters will check into the train station event location in Danville’s Ellis Park, 600 E Main Street, beginning at 8:00 a.m. Painters will receive a list of suggested painting sites (historic sites, parks, bridges, streams, etc.). Canvases will be stamped upon check-in to ensure submitted paintings are done that day. Every painter is allowed up to three canvases for the event. With the artist’s permission, prize winning pieces will be hung in Gallery on the Square for one month, with the artists receiving 70% of the sale price. Paintings sold during Artist Paint the Town can be handled between the buyer and the artist with 100% of the sale belonging to the artist. Paintings must be turned in by 4:00 p.m. at the train station in Ellis Park. Cash prize will be awarded. The first-place winner will receive the Michelangelo $500 award that is sponsored by the Hendricks County Arts Council. Abstract and Title is sponsoring the Rembrandt $250 second place award. Danville Tri Kappa, Alphas, Betas & active chapters are sponsoring the Picasso $150 award for third place. A People’s Choice winner will also be announced. Registration can be done online at www.indianaartgallery.com and is $25 before August 1 and $30 through the close of registration on August 18. The registration fee includes snacks and a light evening meal. The Gallery on the Square, located on Danville, Indiana’s historic square, is a co-op art gallery that features and promotes the work of local artists. In addition to selling art, a variety of art classes are taught in the classroom area. An Artisan Market which offers unique handmade items is located within the gallery as well. Gallery on the Square has been named by Indy A-List as one of the best art galleries in Indiana.